At Valley power Systems you never have to worry about finding the right replacement part. We offer top-of-the-line genuine warranty and replacement parts from Detroit Diesel, MTU, Allison Transmission, DEUTZ, and many more. All of our locations are staffed with factory trained parts specialists to assist you in finding the right new or factory remanufactured part for your particular application. 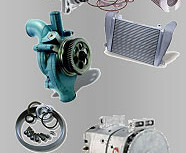 We also offer genuine replacement parts from over 50 leading manufacturers including Active Radiator, Dorman, Kysor, Leece-Neville, Optronics, Unipoint and Freightliner all-makes parts. WHATEVER YOU NEED, WE HAVE YOU COVERED FROM BUMPER-TO-BUMPER. Have a hard-to-find part? No problem. We can quickly locate parts from the manufacturer or from other distributors throughout the country. And with our 24/7 emergency parts availability, you are never more than 24 hours away from the parts you need. Click here to see all of the amazing customer specials currently offered!